Aethyrian Ascension Training | Transcendence Works! Aethyrian Ascension is a spiritual, universal, meditative practice that gets you to deeper, calmer, more centered levels of being without fighting with your mind to try to suppress thoughts or block out thoughts entirely. This form of ascension practice, also called Aethyrian Prayer, is well-suited to the Western psyche because it is based upon a Western approach to the Mysteries and it does not require the suppression of thoughts in order to be an effective practice towards the attainment of deeper levels of consciousness that facilitate the gentle unfolding of levels of illumination. Rather, it harnesses the natural thinking tendency of the lower mind and turns it inward upon itself to destroy stresses at their root. This destruction of root stresses (which we all acquire over time) clears the nervous system and inner consciousness through the vibration of encapsulations of Divine Thoughts, which separates individual stresses (patterns, programs, complexes) and purifies them to purge whatever is not in alignment with the Divine Pattern. While this particular practice does utilize purely transcendent currents, in distinction to other levels of the Western Mysteries that are approached through more chthonic currents, it does not do so in a way that negates the value of the physical level of existence. Aethyrian perspective is both transcendent and immanent. Any notion of the physical level of our consensus reality being less real or less pure than “higher” levels is an imbalanced view of reality that does not accord with the true Western Mysteries. Ascension should not be approached as a method of escapism, but as a valuable spiritual practice that is inclusive of all levels of existence. 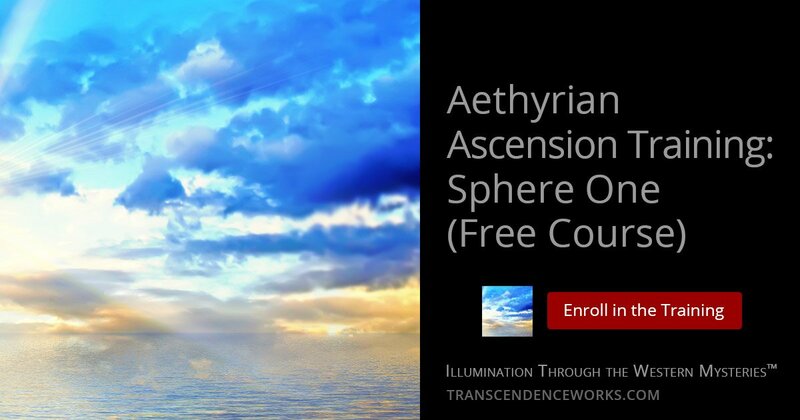 Sphere One of Aethyrian Ascension can be learned in its entirety in a mere 75 minutes (including doing the practice itself for 20 minutes the first time). The process works best when practiced daily (for even only 20 minutes at a time), as the results compound over time with regular practice. These techniques function on the universal ascending dynamic of the vertical currents of Praise, Gratitude, and Love, and the horizontal current of Compassion. They have a distilled simplicity that is deeply powerful, and the experience of them is compounded over time as particular channels become increasingly cleared through regular practice. Note: Live instruction through video sessions will be available twice a month, and those live sessions will be recorded and uploaded into the Sphere One course as well. One of the most helpful things about this practice is that because it functions on thought and the ability to think, it can be done any time regardless of circumstances or external surroundings. Through regular practice you will find that you are able to hold a calm, centered, grounded, ascension state in the midst of any chaotic environment. Must be at least 18 years of age, or if at least 14 years of age have the consent of a parent or legal guardian. Must agree not to attempt to teach the process learned here to others. If others are interested, refer them here for proper training. Note: There is normally a cost for Sphere One training, but it is being offered for FREE as part of the Open Ascension Project™ created by Aethyrius as Overseer of Ordo Aethyrium, an initiatory magical order of the Western Mysteries. Advanced spheres of Aethyrian Ascension are available to all 2° Novitiate members of the Outer Order of Ordo Aethyrium.